Promotional calendars are quite possibly one of the most well known, and indeed one of the most well received, promotional items. Promotional items are an essential feature in the marketing strategy of any business, regardless of the size or type of business. Although considered perhaps old fashioned by a growing number of technologically minded individuals, these calendars continue to have widespread appeal. What are Promotional Business Calendars? Promotional business calendars will generally feature the logo, name and contact details of the business. They are available in a wide variety of formats such as commercial calendars, shipping calendars and wall planners which tend to be more functional than overly graphical. Then we move onto wall calendars, memo calendars, desk easel calendars and CD case calendars, which mainly tend to feature photographic images. On the basis that we use the same calendar for an entire year, promotional calendars will continue to promote the business for that same entire year. The potential promotional reach from that one calendar is therefore astronomical, and even more so on the basis that calendars are normally hung where they are readily and easily seen. Promotional business calendars have the sheer brilliance of being able to suit the needs of almost all individuals. We as individuals all require a calendar or diary of some description, to enable us to plan and organize our lives on a daily basis. Even those individuals who embrace modern technology sometimes prefer the comfort and ease of having an “old fashioned” calendar to hand. In addition, calendars appeal to business contacts, if only to save on the cost of their own stationery bill! The end result is however, the same. The other business is still effectively promoting the business behind the promotional calendars to a whole host of potential new customers and all simply by using the simple calendar. In addition to being a suitable promotional gift for almost any individual and/or business contact, promotional business calendars are relatively inexpensive to produce. They also have the added luxury of being able to provide so much more information than any other promotional gift. Each month can be used to depict a different image, whether this is different images of the surrounding local landscape, images promoting the products and/or services of the business or something entirely different, the sky really is the limit. Although I am very much a fan of my virtual diary and calendar which synchronises all appointments across phone, tablet and desktop computer, I still very much rely on printed calendars. My personal favourites are the large commercial shipping calendars, featuring the week numbers. These are absolutely ideal for assisting in scheduling jobs. Although I use the calendar on my PC, this large physical calendar helps me plan clearly. For home use I find the memo wall calendar to be the most useful, so that I can jot down quick notes and key dates as a visual reminder. The only downside to these types of calendars is the fact that they are perhaps considered outdated. Although they are a great entry level promotional item so to speak, in terms of cost and appeal, there is nothing new and unique about them. There is not that “wow” factor, that special something, that makes individuals stand back and take notice. The only way to get around such a downside is to inject some originality into the calendars. It may therefore be a worthwhile exercise to get the input of the business’ employees in this regard, as they may bring some great ideas to the table. Take the ‘Calendar Girls’ approach and involve the workplace colleagues or community. I am not suggesting that anyone needs to take extreme measures or pose naked with a variety of strategically placed kitchen utensils, however the benefit of including employees in the process can be quite remarkable. Not only does the business benefit from being furnished with some new and fresh marketing ideas, but the employees will be delighted at having been included in such a project. This in turn boosts morale as a whole and a boost of morale in today’s workplace is almost priceless. Much flexibility on the basis that calendars have the potential to provide as much or as little information as the business wishes. The lack of that much desired “wow” factor. 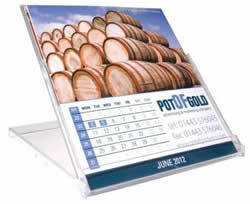 Promotional calendars are a standard promotional item, with mass appeal. 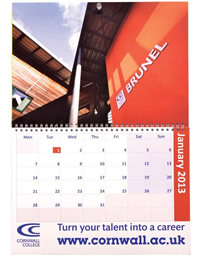 On this basis promotional calendars really are the universal gift and the one area in which no business can go wrong.